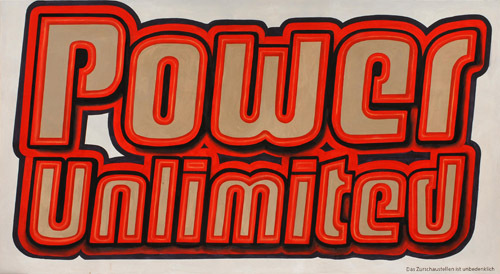 Wawrzyniec Tokarski, Power Unlimited, 2009, acrylic on canvas, 8 x 14'. Descriptions of Wawrzyniec Tokarski’s paintings consistently refer to his use of logos and slogans taken from the world of goods and consumerism. While such motifs are featured in the works in this exhibition, the artist now appears more obviously concerned with irony. The surfaces of some of the paintings have been built up in a rapid and fluid manner; like his other works, these pieces aim for a blend of alienation and recognition. Familiar brands and messages with typography rich in connotations are depicted and interspersed with elements that function schematically, such as a fragment of a landscape or a figure. The critical impetus behind this textual and visual tension is evident, yet Tokarski’s paintings are difficult to reduce to simple messages, and that is what makes them so perplexing: He can create an open horizon of meaning through truncated messages. Tokarski is not afraid of the aggressive pictorial syntax so often found in public space; instead, he combats it and turns it against itself. This exhibition demonstrates that he has yet again altered the way he uses his constellation of motifs: It is now more complex and brazen, and yet more nonchalant. It is thus both logical and ironic that Tokarski renders overlapping messages in the style of a sign painter in pieces like Höhere Gewalt (A Higher Power; all works 2009) and Meine Meinung (Hinweg Damit) (My Opinion [Away with It)]). In Power Unlimited, he accentuates the use of a single font and depicts just the title of the work, written in a large and energetic stylized type that threatens to burst through the surface of the painting. In smaller watercolors on unprimed canvas, Tokarski is less bold, though equally incisive. For example, Hochspannung (High Voltage) reinterprets a Romantic landscape, rendering it catastrophic. In this work, a cloud that seems as powerful as anything nature itself could produce overshadows the contours of a destroyed transmission tower. Tokarski’s conscious assimilation of cliché-laden images is by no means histrionic, and for that very reason it is as powerful as a symbolic apocalyptic image. Translated from German by Jane Brodie.